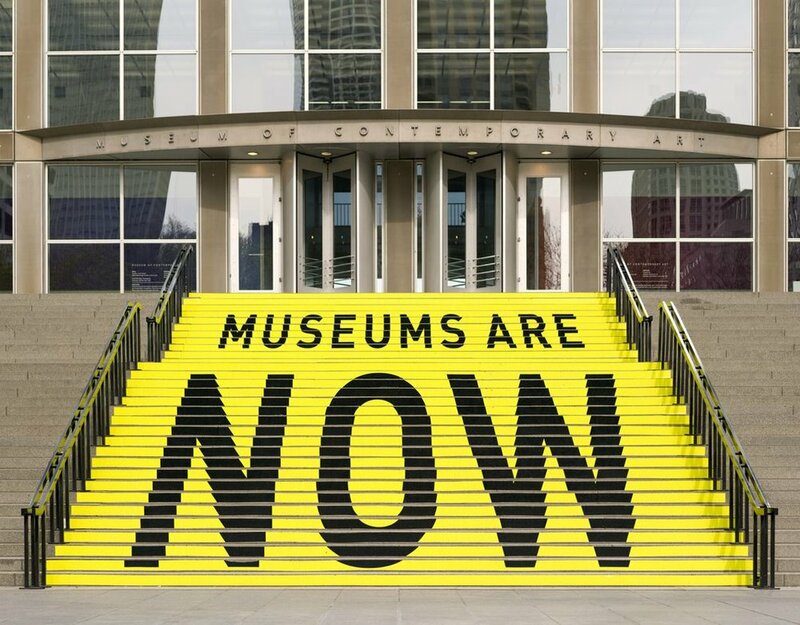 Photo courtesy of the Museum of Contemporary Art Chicago's website. avery r. young walked onto the stage holding a cup of tea. He was dressed all in black with a long robe down to his ankles, resembling that of a church choir. That evening’s performance resembled something of gospel itself, but instead of a church pit, the stage sat in deep blue lighting reflected off metal microphone stands, showing something of the emotional magnitude of what was to come. “Protest Pretty,” young’s new performance project with his band De Deacon Board, invited audience members to share space inside his mind that night at the Museum of Contemporary Art Chicago, followed by a conversation with Jamila Woods and Tasha Viets-VanLear. The Oct. 21 performance, part of a series of free events to celebrate the MCA’s 50th anniversary, drew in a crowd of hundreds of people of all ages eager to see the celebrated local artists. young is often recognized for his work in poetry, but the multi-disciplinary artist showed off singing, songwriting and performance skills that evening, his background in poetry adding a splash of enigma to the set. The all-Black band creates music at the intersection of blues, funk and gospel, with young acting as their choir director and pastor throughout the performance. He began the set by introducing his band members by name, from the background vocals to the trumpet, saxophone, bongo drums and guitar. “We came here to share with you this idea,” young began. young's voice boomed, filling up the auditorium. Toward the end of the performance, the setting of a theater at the MCA almost felt wrong for the set, which could have comfortably been picked up and moved to a concrete basement stage. young often asked the audience to participate, and had them standing on their feet, singing along and clapping by the end. The room buzzed with excitement, and people were there to see avery young do his thing. Then the theater went black instantly, the audience still left swaying and a few last lyrics shouted out from the crowd. Everything stopped, and the audio from a television news report came onto the speaker. The crowd was left listening to the story of Martin Luther King Jr.’s death fill the room, as the band members slowly exited the stage one by one, the audience too focused on the sound of America’s public chaos to notice anything on stage. They no longer wanted to participate in the celebration of Blackness they had just seen on stage, a poignant reminder that Blackness was not always something to be celebrated by their ancestors. There were consequences for being, and still are. The performance ended this way, and the audience was left with the knowledge that admiring and participating in cultural celebration wasn’t enough on its own, without acknowledging the struggles and history of that same culture. Many want to dance along to Black music, without a thought of where it’s coming from. “Protest Pretty” toys with the idea that protest music isn’t always the danceable music blasting from car stereos down Milwaukee Avenue today, but emerges from a magnitude of history that was not pretty in any way. young reminds us of the many forms protest music can take, and how sometimes healing and community go hand in hand – and sometimes the artistic healing process is more personal. This is what young pokes at in conversation after the performance, speaking with Jamila Woods and Tasha Viets-VanLear. The three don’t have quite enough time to get to the heart of the problem, but converse on stage as if it was 3 a.m. at the end of a good party, and they were old friends connecting over common history. young is also a teaching artist, mentoring youth in creative writing and theater. He tutored Woods at Young Chicago Authors when she was in high school, encouraging her interest in poetry and telling her to never stop writing – Woods spoke of him as one of many inspirations to her when at the point in life where one needs motivation to put effort into their artwork. The three continued to discuss the intersection of art and activism, revisiting old themes and discovering new ones. As artists, they create that space for themselves. Woods said she writes in the tradition of Chicago poet Gwendolyn Brooks – she might not be intentionally political in her work, but she writes about what’s under her nose, what she’s familiar with. In most cases, her experiences as a Black woman moving through this world seep into her writing inevitably. This isn’t always a political statement, but a statement of existence, she says: to be here, to be wholly one’s self, and allow the space to exist. be blk. usin word(s) like rectification durin my talk bout music & revolution blk! All three artists have upcoming performances on Nov. 22. Jamila Woods and Tasha Viets-VanLear will be together in the Black Wednesday show at Metro Chicago, a show for women of color. More information is available here. Avery Young will perform at the California Clipper. More information is available here. On a related note, the Poetry Foundation in Chicago will be teaching a workshop centered around the poetry of protest on Sunday, Dec. 16. More information available here. Contact Megan by email at mstringerpilot2015@gmail.com, or follow her on Instagram.